First responders administer aid to the victim who later died from his injuries. Photo via OnScene.tv. Authorities Sunday released the name of the man who died after he was struck by a car while riding a scooter on a Chula Vista street Saturday morning. 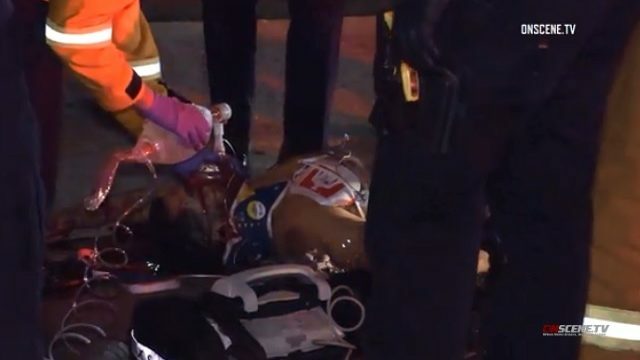 Esteban Antonio Ramon Galindo, 26, was riding a motorized scooter just before 4 a.m. Saturday on Third Avenue near Quintard Street when he was hit, according to the San Diego County Medical Examiner’s Office. He was taken to UC San Diego Medical Center, but never regained consciousness and died a little more than an hour after the crash. The driver stayed at the scene and was cooperating with investigators, Chula Vista Police Lt. Rusty Rea said at the time, adding that investigators didn’t believe drugs or alcohol to be factors in the crash. It was the second crash involving an electric scooter in several hours — around 9 p.m. Friday, a woman sustained life-threatening injuries when she crashed a scooter in Hillcrest. San Diego police said the woman in that case was not wearing a helmet and had been drinking alcohol.